Health and Human Services refers to social services, education, public health, health care services, animal welfare, sustainable food, social equity, veterans’ affairs, populations at risk, and related matters. Posted in Health and Human Service on November 2, 2017 by Comms. On Monday, Mayor Adler proposed a solution to the Downtown Puzzle, his name for the interconnected and geographically contiguous challenges in the eastern part of downtown Austin. After months of discussions with community groups represented at a City Hall press conference, the Mayor proposed harnessing downtown economic activity, including an expansion of the convention center, to raise $30 million for permanent supportive housing for the homeless and create an ongoing funding stream to address homelessness that starts at about $4 million a year until 2021 when it doubles. The Mayor’s proposal, which requires Council action, does not include any property tax increase. 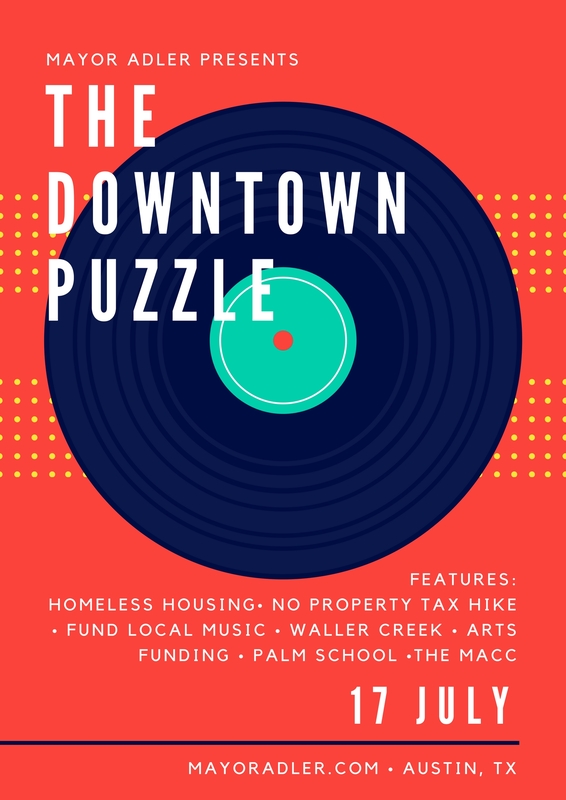 “We have figured out how to put the Downtown Puzzle together by making tourists pay to house the homeless and by harnessing the power of Austin to benefit all Austinites. This plan won’t raise your property taxes, will expand our tax base, and makes a big down payment on the moral imperative to house the homeless,” said Mayor Adler. Posted in Big Ideas, Economic Opportunity, Health and Human Service, Housing Heroes Austin, News Releases on July 14, 2017 by Comms. Posted in Affordability, Health and Human Service, Press Clips on February 23, 2017 by Comms. As federal lawmakers discuss repeal of the Patient Protection Affordable Care Act, Mayor Adler is joining with his colleagues across the country today to urge Congress to consider the serious impact that losing healthcare coverage would have on millions of Americans. Mayor Adler is participating in today’s NATIONAL MAYORS’ DAY OF ACTION, which involves mayors in cities from coast-to-coast hosting meetings and/or events with federal, state and local leaders, small businesses and community groups to stress the critical importance of preserving access to affordable healthcare. Posted in Health and Human Service on February 22, 2017 by Comms.